The Civic Si may not garner the headlines like its Type R stablemate does, but it’s still a compelling value. While some dealers subjected this car to Type R pricing strategies, such price-padding in long in this generation Si’s past. The model year changeover means you can start to score some deals. Who Is Paying $5000 Over MSRP For A Honda Civic Si? I got a few requests to shop for a Civic Si when the car first launched and I was met with Honda dealers who thought they were basically selling a Type R-lite. Some stores held firm to MSRP while others offered paltry discounts of a few hundred bucks. Even the lease payments were surprisingly expensive, despite the fact that the Civic’s historically high resale value should have made the payments reasonable. Well, if you have been holding off getting your hands on the all-new “sport injected” Civic our friends at CarsDirect.com have some good news. Now that the 2018 model is due to hit the showrooms with no changes over the 2017 car, Honda is taking some steps to clear out the older inventory. Not only can you lease a Civic Si for $199 per month with $2,299 due at signing (before tax and fees) you can also get super low financing rates at 0.9 percent for 60 months or 1.9 percent for 72 months. 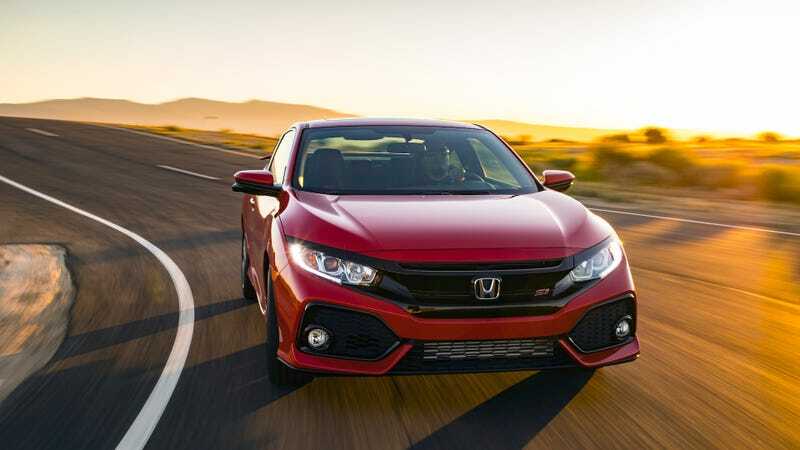 CarsDirect’s senior pricing analyst Alex Bernstein states that the new Civic Si lease program makes it super competitive against other sporty (and not so sporty) cars in a similar price range. Based on our analysis, this equates to an extremely good deal given the vehicle’s nearly $25,000 MSRP. Here’s a look at what this looks like next to some competitors. We threw in some other, less expensive vehicles for illustrative purposes. With an effective cost of $263, the Si is $91/month cheaper to lease than the GTI. If you can believe it, it’s even $1/month less expensive than a regular Golf despite a nearly $3,000 difference in MSRP. For those of you not into leasing, the cheap financing is certainly worth taking advantage of. If you shop carefully you can likely get a pretty solid discount off the sticker price as well. Last month I got a Si deal for someone in the Chicago metro and managed to get $2,225 off the MSRP which is well below the dealer invoice. So if you are looking for an affordable and sporty compact to make your commute a bit more bearable, now is the time to shop around and grab a deal on a 2017 Civic Si.